The benefits to earning a college degree are numerous. Individuals who have reaped the benefits of higher education are more likely to land a job and earn moreoverall than their counterparts with high school diploma credentials. Unfortunately, the cost of attending school is on the rise, and the fear of debt has left many potential college students wondering how they are supposed to go about paying for their education. In the wake of large school price tags, would-be students are looking for creative paths to education online. While there are a growing number of options for receiving your degree in the virtual world, there are just as many scammers on the market looking to make money off of an unknowing student’s enthusiasm or desperation to earn a diploma. Here are a few ways to spot an online diploma mill and save yourself from big disappointment in the end. Legitimate online options for earning a degree still involve a significant amount of time and investment. Just because a program is hosted online doesn’t mean it’s going to be a fast and easy diploma fix. Students are still expected to learn online, and a legitimate program will hold students to a standard educational timeframe and requirements before earning a diploma. Online diploma mills promise extra rapid results, and speedy diploma deliveries at a significant cost to the student. When searching for legitimate and legal online programs, be sure to note how long a program takes to complete. It’s not realistic to earn your diploma in a week, so if you come across an advertisement for a “degree-program” that seems too convenient to be true—it probably is. Higher education institutions, whether they host classes on a campus or online, must be accredited by a governing body in order to accept students and hand out legitimate diplomas. Accreditation can be achieved through a variety of national and state routes, and is always publicly documented. Be sure to check a program’s accreditation before signing on the dotted line or sending any type of payment. Online diploma mills might try to lead potential students to believe they are accredited, so it’s important that you familiarize yourself with national accrediting institutions and see if your program has been approved for education. Online diploma mills may be sneaky, but word of mouth seems to be the best route to putting them out of business. While an unfortunate number of students fall for these scams, it’s possible to get a heads up on what companies or “schools” are offering falsified diplomas online by doing a simple search. See what others are saying about these companies or programs online by following discussion boards and forums. 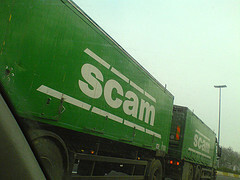 Familiarizing yourself with potential scams is one of the best ways of avoiding disappointment and deception. Unfortunately, online diploma mills are not an uncommon occurrence. While some students falls for tricky antics and advertising, others are looking for a fast route to receiving “credentials” to present to potential employers. One very efficient route to protecting yourself from these types of scams is to speak to your high school guidance counselor before you do an independent search online. With the number of scam artists and companies on the rise, guidance counselors must be up-to-date on the best methods for students protecting themselves and avoiding trouble down the road. If you have any questions or hesitations about online schools that are offering quick degree programs, be sure to check with your counselor who will have access to information that might reveal a scam for what it is, before you find yourself in an unfortunate situation.